Broom and brushmaking was still a traditional cottage (or domestic) industry in the late-18th and early-19th centuries. Each hair was knotted to the wooden broomhead by hand, avoiding the lumps and tufts that glue could sometimes leave. Gradual improvements in technology created the environment for the mechanisation of production lines. 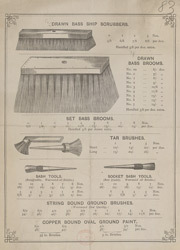 Goods, including brooms and brushes, started to be mass produced in factories for the first time.